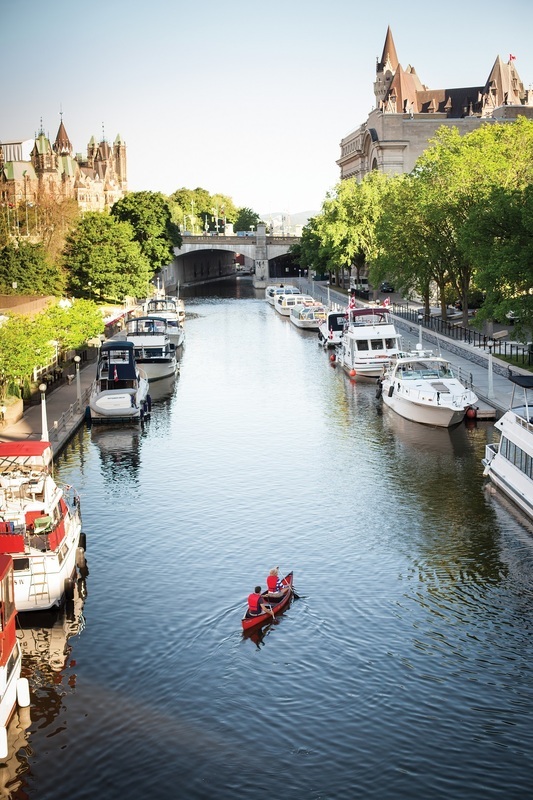 story by Roderick Eime with additional text by Ottawa Tourism. One of the first things told to me by a local is that Ottawa is the city fun forgot. Well, I don't know where they got that idea from because now, on my second visit to the capital, I've found it a most welcoming and vibrant city, with plenty of fun things to do. Aussies who have travelled to Canada know this already, especially the hordes of young ski bums and bunnies who regularly exchange into the various ski resorts in the country's western regions, that Canadians love us. That Commonwealth affection is similarly returned. Getting around Ottawa is dead easy. It's a simple city to walk, cabs are easy and there is the famous Uber rideshare just like almost everywhere else. I chose the familiar 'hop on, hop off' double decker tourist bus as seen in so many major cities and tourist destinations. Stamped with 'Lady Dive' signage, the buses have a live guides and make 15 stops at key locations around town. In a jam-packed summer's day, I join the throngs for a sample of Ottawa's fabulous hospitality and activities. My morning is taken up with whitewater rafting, a 3.5-hour trip that departs from Britannia Park (a lovely beach and park about a 15-minute drive west of downtown) and ends just west of the Canadian War Museum and downtown Ottawa. We crash through a series of small whitewater rapids within view of the city skyline in inflatable boats while the daredevils among us do the famous cliff jump and bridge hang. A great family adventure. Come lunchtime, I was ready for some of Ottawa's famous fare and the place to go is the ByWard Market, one of the oldest and largest farmers’ markets in Canada, as well as the name of the eclectic neighbourhood that surrounds it. 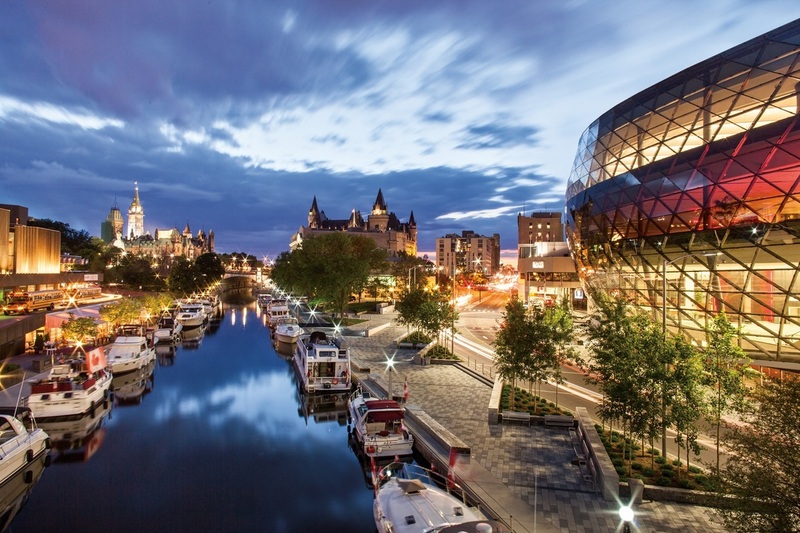 Ottawa’s entertainment district is filled with great restaurants, clubs, bistros, coffee shops, boutiques and food retailers. 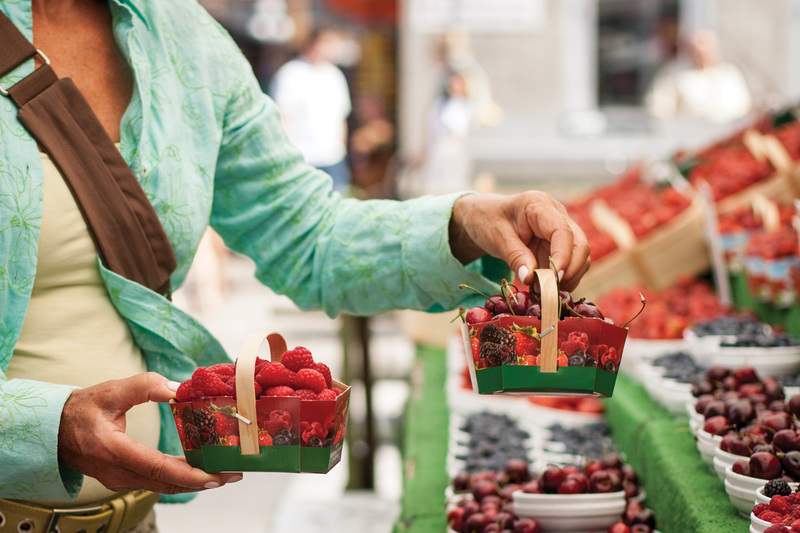 In the height of summer, up to 175 outdoors stalls sell plants, flowers, fruits and vegetables as well as art and crafts. You’ll find ByWard Market vendors outside, no matter the weather, 363 days per year (closed Christmas Day and New Year’s Day). Check out some of the staple food shops—some of which have been around since the early beginnings of the Market: Saslove’s Meat Market, House of Cheese, Lapointe Fish, and more. And make sure to visit the ByWard Market Square building, which features a wide selection of food vendors, artisans and boutiques. And don’t miss the cobblestoned courtyards behind the shops of Sussex Drive; from south to north, the Clarendon Courtyard, Jeanne d’Arc Courtyard, Tin House Courtyard and Beaux-arts Courtyard each have their unique charms—from restaurant patios to quirky public art. My choice is the funky Sidedoor Restaurant, a contemporary kitchen and bar in York where I dine on such novel dishes as tuna sashimi with yuzu marmalade and Thai basil sausage tacos. There's plenty of choice for the afternoon too, so let's head to The National Gallery of Canada, one of the country’s finest art museums and the permanent home of the world’s most comprehensive collection of Canadian art, including Inuit art. The Gallery sits in one of the most spectacular sites in Ottawa, and its award-winning architecture (designed by Moshe Safdie), features the luminous Great Hall, spacious galleries, and interior gardens and courtyards. You can't miss the iconic Louise Bourgeois sculpture, Maman, a mammoth 9.25m bronze spider. Back on the bus, it's time for the Canada Aviation and Space Museum, home to the most extensive aviation collection in Canada and one which ranks among the best in the world. Canada’s rich aviation heritage is revealed through exhibits of vintage aircraft from the museum’s permanent collection. Interactive activities, films, demonstrations, and guided tours offer visitors a chance to explore the story of flight. Open-cockpit biplane rides and helicopter rides are offered for an extra fee, weather permitting. The museum is also home to the Canadarm—the mechanical arm used on the NASA Space Shuttle. Star Trek fans can get a dose of their favourite TV series with a special exhibition until mid-September. Otherwise, I could venture to the Canadian War Museum located along the Ottawa River just west of the Parliament Buildings and downtown Ottawa and a living memorial to Canada’s proud military history—from the earliest days of New France to current-day operations. It features large artifacts such as tanks (including a super rare German Panther) and airplanes, as well as a stunning collection of war art (including a gallery of “nose art” from World War II Lancaster bombers). If I have the courage, I might take a tour of local ghost stories and Ottawa's “darker” history when the lights are low and the atmosphere is just right for a good ghost story. The tour guides wear cloaks and carry a lantern as they lead their group from one haunted spot to the next. 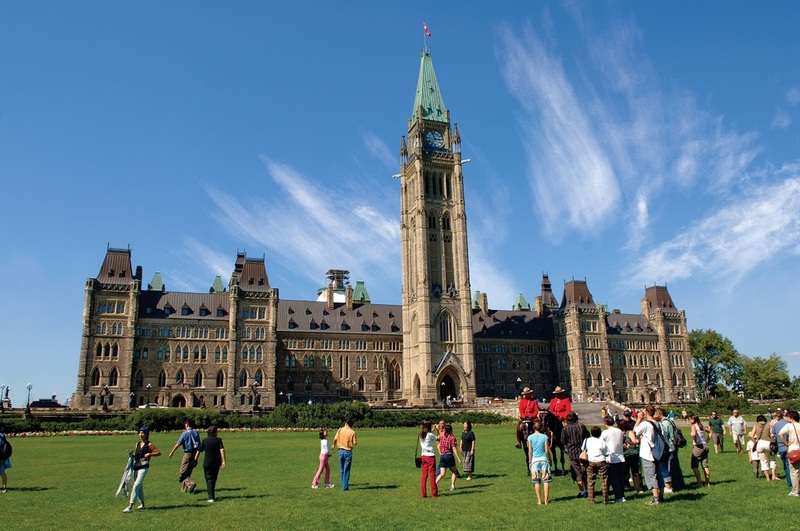 Before I head out tomorrow, there's time to join the crowd for the ceremonial changing of the guard up on Parliament Hill or perhaps visit the Diefenbunker, a Cold War shelter built to house the entire government in the event of nuclear attack. And before you head there, brush up on a little of your high school French as Canadians will be delightfully tolerant of your rusty pronunciation. Even the everyday greeting is “Hello, bonjour”. The writer stayed at ARC the.hotel, Ottawa’s first boutique hotel to offer comfort and luxury paired with contemporary design in the serene and sophisticated ARC the.hotel. 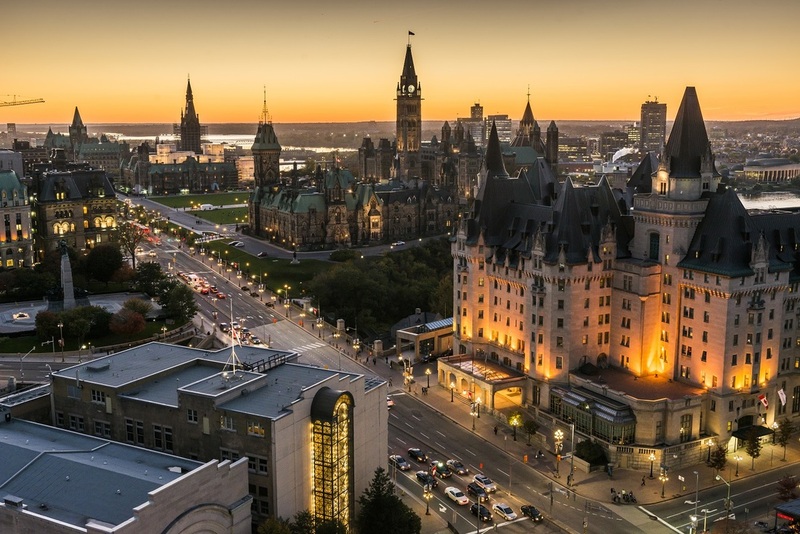 Located in the heart of downtown Ottawa, ARC the.hotel is within walking distance of the major attractions mentioned above.